The glossy lifestyle and luxury real estate magazine THE ADDRESS was recently recognised with a gold award for its stunning design and inspirational copywriting in Hermes Creative Awards 2015. Organised by the Association of Marketing and Communication Professionals (AMCP), the international luxury living magazine won a coveted Hermes Creative Awards 2015, serving as a testament to the publication’s excellence and creativity. Competing with over 6,000 entries from more than 20 countries, the flagship publication garnered a Gold Award in the category of Online/Digital Magazine. The international creative competition has grown to one of the largest of its kind in the world. With a who’s who line-up of winners, the Hermes awards are a prestigious recognition. 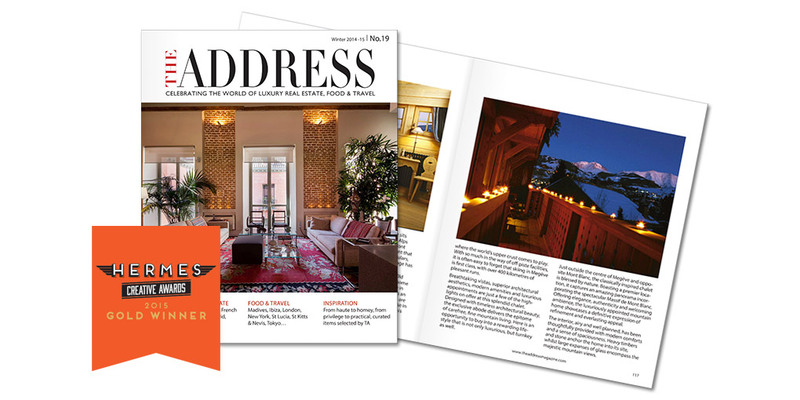 Founded in 2008, THE ADDRESS is today one of the world’s finest luxury homes, food, travel and lifestyle magazines. Each coffee-table quality issue of THE ADDRESS Magazine features some of the most exclusive residential properties for sale from around the world, eye-popping private homes and estates for sale, architectural gems and the finest in apartment living. With a focus on the destinations, the food and the chefs, the magazine’s Food & Travel section brings together culture, cuisine, and the people to give life to a beautiful travel experience for its readers. The highly visual content shares experiences that reveal a true sense of place – turning luxury holidays, family trips, and weekend getaways into transformative journeys. The magazine also showcases carefully curated items, which have been crafted with thought, purpose and style. Whether highlighting fabulous foodie inspirations, nifty tools, discoveries for the home and traveller, well-being and wellness tips, this is about living life gloriously and stylishly. THE ADDRESS Magazine delivers precise and relevant information in an award-winning format that lavishes the reader with spectacular imagery and engaging editorial. It brings the luxury lifestyle in a way that’s artful and informative. Flip through the latest issue of the luxury international property & lifestyle magazine, or subscribe for your free copy of the international lifestyle and luxury real estate magazine THE ADDRESS.